California ChangeLawyers awarded 61 scholarships to law students at a special gala in Los Angeles, CA on October 5, 2018. Klinedinst’s Heather Rosing serves as President of the organization, which distributed close to $400,000 in scholarships to students from law schools all over the state of California. Several awards were also presented by the 29-year-old statewide organization, recognizing individuals that have shown fearless commitment to breaking the cycle of inequity and advancing systemic change for those who have been denied fairness and opportunity in the legal profession. 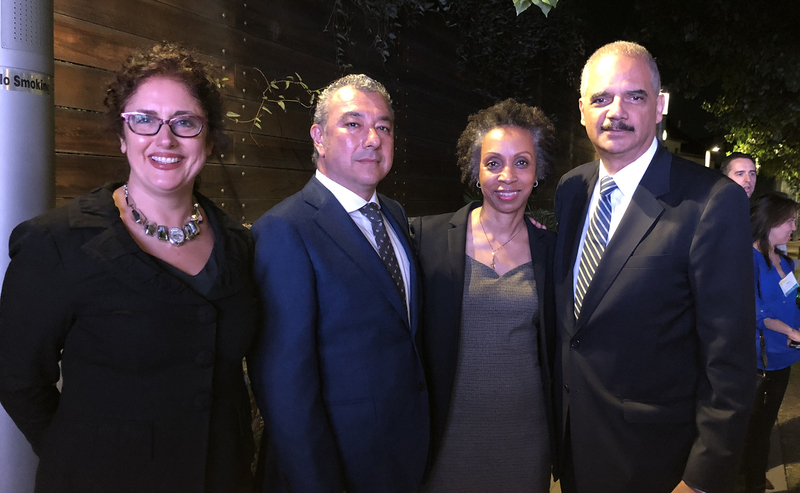 Pictured (l-r) are Heather L. Rosing, Leo Trujillo-Cox, Nina Shaw, and Eric Holder. LOS ANGELES, CALIFORNIA – California ChangeLawyers, a statewide foundation led by Klinedinst Shareholder Heather L. Rosing, awarded scholarships to 61 diverse law students last night at a special event at LA Plaza de Cultura y Artes in downtown Los Angeles. The scholars were selected from nearly 350 applications by the foundation’s Board of Directors after a rigorous review process. Applicants were asked to demonstrate their ability to overcome adversity and demonstrate leadership. Students were also asked to provide recommendations from a variety of sources, including law school faculty, private bar members, and judges. The scholars came from law schools all over the state of California. Almost two-thirds of the scholars were women, and nearly all of the scholars are first-generation law students. In total, the foundation distributed close to $400,000 to these 61 law students. Another award recipient was Leo Trujillo-Cox, Executive Director of the UCLA Law Fellows Program. Trujillo-Cox, like all of the awardees, was honored for his commitment to breaking the cycle of inequity and advancing systemic change for those who have been denied fairness and opportunity. Formerly the California Bar Foundation, California ChangeLawyers is a statewide foundation that empowers the next generation of lawyers, judges, and activists to create a more diverse legal profession, a fair justice system, and a better California.